FAIRFIELD, Conn. (January 24, 2019)— Robert Hirsch , artist and photographic historian, will deliver the 2019 Samuel and Bettie Roberts Lecture in Jewish Art . The lecture entitled “Ghosts: An Artistic Meditation on the Holocaust and Anti-Semitism,” will be held on Wednesday, February 6 at 7:30 p.m. in the Dolan School of Business Dining Room. 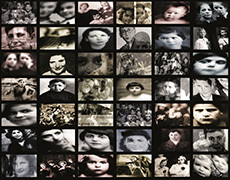 Hirsch’s lecture will examine the artistic, cultural, political, and personal principals that informed his art exhibition, Ghosts: French Holocaust Children , currently on view in the Fairfield University Art Museum’s Walsh Gallery. He will discuss how he created the installation, the history that informs the project, and Israel’s place on the world stage. Additionally, Hirsch will review the interconnection between photography and history. Ghosts: French Holocaust Children is a three-dimensional installation of sculptural and photographic work, which acts as an ethereal commemoration to the abbreviated lives of over 11,000 Jewish children who were deported from France to Nazi death camps during World War II. These children were among more than 75,000 French Jews deported under the Nazi plan for the “Final Solution to the Jewish question.” Of those French Jews transported, only 2,564 survived the Shoah. At most, 300 of these Jewish children survived. The project was created based on documents and photographs collected by author, lawyer, and Nazi-hunter Serge Klarsfeld, which have been reinterpreted and presented in the form of three 1/5-scale boxcars containing over 600 expressionistic portraits of the deported children, plus a series of mural-sized individual portraits. Hirsch is the author of several books including Transformational Imagemaking: Handmade Photography Since 1960; Seizing the Light: A Social and Aesthetic History of Photography; Light and Lens: Photography in the Digital Age; Photographic Possibilities: The Expressive Use of Concepts, Equipment, Materials, and Processes; and Exploring Color Photography: From Film to Pixels . Hirsch’s work has been exhibited in over 200 solo and group shows. Free and open to the public , this lecture is made possible by the Samuel and Bettie Roberts Memorial Endowment Fund. All are welcome, to join Robert Hirsch, on February 6, from 3:00 - 4:30 p.m., to preview the exhibit before the lecture . Contact the Bennett Center at bennettcenter@fairfield.edu or call (203) 254-4000, ext. 2066 for reservations.